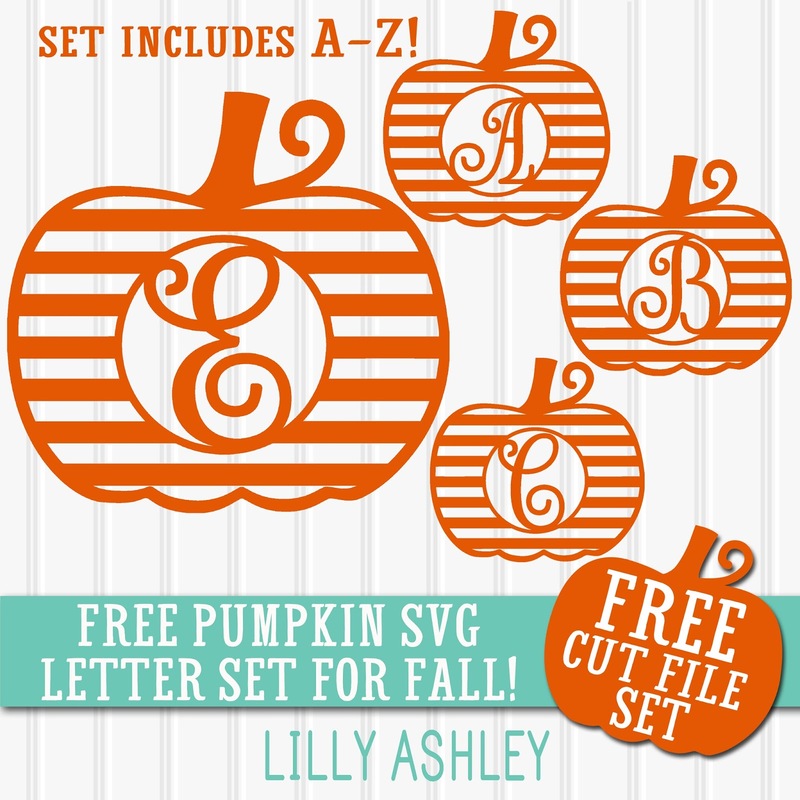 We're rolling right along this week, so today we bring you a freebie set of pumpkin letters for cutting! This FREE SVG set comes with all letters A-Z and a solid pumpkin for using as a background layer if you want to use more than one color. Here's one of our projects using these! 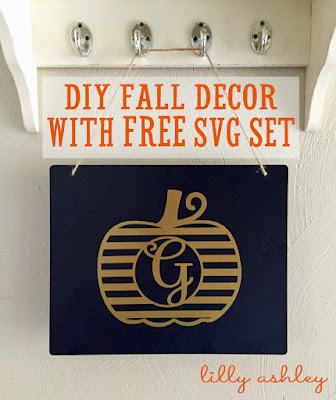 In the download folder you'll find the SVG, PNG, & JPG file formats, each in their own zip file. Feel free to use within your own design/product for commercial use! Credit not required but always appreciated!! We do ask for no selling or redistributing of these files. Don't forget to unzip files prior to usage! Click the ribbon below to head the download folder! A reminder for the Silhouette users...these SVGs like the Designer Edition of Studio. Standard edition users: grab the JPG format and use with your tracing function. 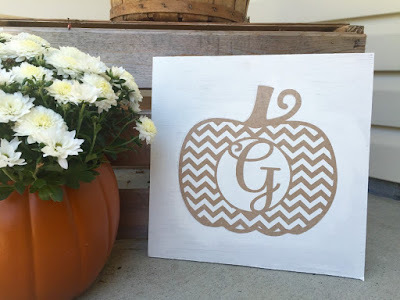 Pumpkins are large, black and white to make for easy tracing. 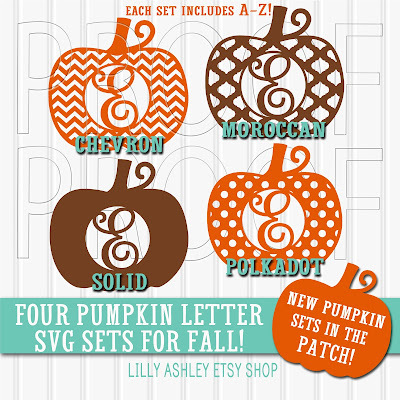 This set is also available in four different styles in our design shop! Each set is commercial use approved! Here's what the chevron pumpkin looks like on a wooden sign for Fall porch decor! 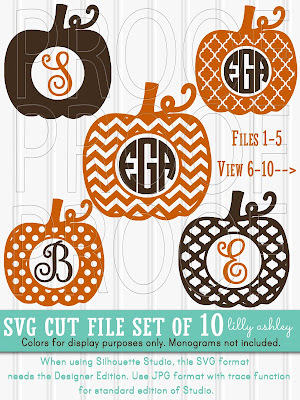 This set of ten (five shown above) comes with a blank center to add in your own monograms/letters! Click the image above to see that whole set! 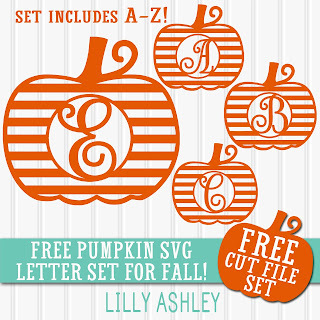 Enjoy today's freebie striped pumpkin letter set, and check back soon for more fun free SVGs, printables, and more! Follow us along on Pinterest to stay updated when we add new freebies! Thank you very much..this is lovely. Your download folder link is going to live.com and trying to install some type of update to Windows. I didn't hit next to find out what it was.